I love jewellery as next as the other female magpies in the world, but sometimes I start to get a little bored of how samey samey it all is. Like it big and bling? Fine, go to Net-A-Porter or Jane Norman. Want it kitsch and retro? Check out Tatty Devine and PunkyPins. Want it a little kooky but still cute and affordable? Topshop, Hannah Zakari and ASOS are your merchants of choice. No matter what you wear, you still manage to define yourself, into some weird sub strata, whether it be by style, budget or personality- and don’t even get me started on celeb affectations. What do you do if you want something truly unique, but haven’t got the energy or patience to go and create something yourself? Well, in this case, you can come to me, where I’ll show you some strange but beautiful jewellery oddities that I guarantee you no one will else will be wearing down Wetherspoons. The following pieces are all created using interesting ingredients- that’s right, ‘ingredients’, not precious metals or Swarovski bling. Think animal bones, honey and milk! (Yes, really). Note: No butterflies were harmed in its creation. 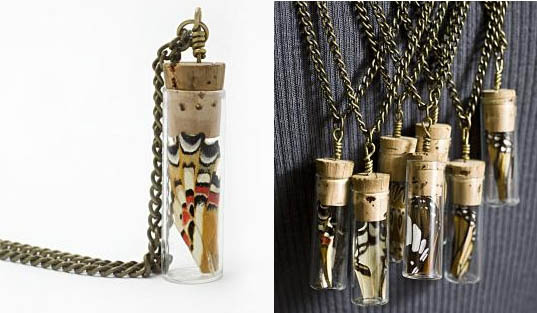 A super sweet wing hangs in a little glass vial, and is draped on a chain round your neck. I love butterflies, and all wings are obtained from a butterfly sanctuary after the owner has expired* (*sob). This is incredible, as you’ll never get one the same. Get it here for $45. Created from real human hair, these pices are whimsical and floaty with a strangely alluring charm., You can opt for one set with pearls or silver beads.$30-$38 from Stephanie Simek . Check out more unique necklaces after the jump.